Our Extended Day program is child care provided before and after the regular camp day. The program is designed to be a safe and convenient option for parents with challenging schedules. Here, campers get the chance to play at their own pace with campers of all ages. They are free to float between a variety of centers led by our staff such as Field Games, Court Games, Sprinklers, Board Games, Crafts, Building Activities (Legos, K’Nex) and Imagination Station (Performing, Dolls). If you will need to use Extended Day on a consistent basis, application and payment is due on May 1. You will be billed by the half hour based on your application schedule. You may also use Extended Day as a drop-in service on days that you need it during the summer. We ask that you let us know as far in advance as possible for staffing purposes. We utilize Sewataro counselors for our Extended Day staff. Jess returns for her 5th summer, this time leading our Senior Camp Zuni tribe, and she’s excited to take the lead at Extended Day. A Narragansett, Rhode Island native, Jess spent many childhood summers at her local YMCA camp, where she subsequently worked as a counselor for five years. 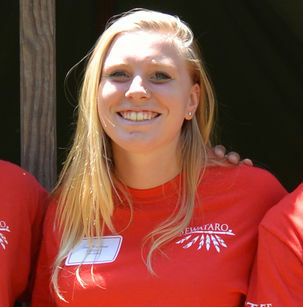 She was drawn to Sewataro’s “happy and fun environment,” and loves working with the campers, while simultaneously having fun and helping to shape camper’s minds and morals. Jess is a three-season athlete at Rhode Island College, where she is pursuing a double major in Psychology and Movement Studies with a concentration in Youth Movement. Jess has one more year of undergraduate courses, and then continues directly into a final year of graduate school, with plans to study Child Physical Therapy. She runs both cross country and indoor track, and plays women’s lacrosse for her school (and year round). Extended Day campers are dropped off/picked up by a parent or parent-designate. If you enroll only for the morning or afternoon Extended Day program, one-way bus transportation is available for the opposite morning/afternoon when not enrolled. You may pack breakfast/snack in your child’s lunch bag to eat during the morning/afternoon. Please Note: Extended Day will not be available in the afternoon on Friday, August 16—the final day of camp.